Where exactly are you today? Unless you have a SIM held over from the previous visit, things will be somewhat different from your previous visit. Old unlimited plans have been replaced with a lesser animal. If you reached the criteria I mentioned earlier, you needed simply to apply the short code *934*180# Dial for 180 days of added validity for 12 baht. *934*30/90/180 Dial for the corresponding amount of days. No need for ten baht top up. Those are only necessary for AIS. It is not 6 GB x 2 months as you put it, it is 6 GB over two months. So 3 GB x 2. Not only that, but at the lowly speed of 512 kbps. You can get full speed at much the same price. 7 GB over 60 days with AIS for 427 baht, as opposed to 395 baht with Truemove H limited to a maximum of 512 kbps. One can pick up a 49 baht Truemove H SIM at the airport and use the 90 MB of data for any immediate needs. Then to collect the SIM from prebokked accommodation then to register. 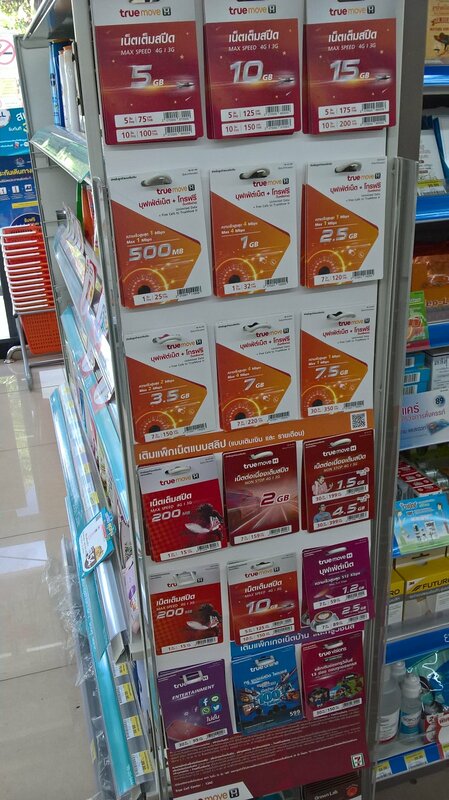 https://www.lazada.co.th/products/true-4mbps-6-i266394016-s415147852.html Free first month 150 baht for subsequent. Last time I went to 7 11 and they would only sell me the tourist rip off package at 900 baht . As Im only going to be in Thailand 45 days not worth it﻿ . You come 45 days or 5 days ? 'As I am only going.. ' is upcoming, but if I read the sentence before that, in combination with another reply... 45 days was the last time you was in Thailand and now 5 days. Right? Anyway, packages for the phone comes in 7 days , 30 days and some even 60 days. Perhaps you need to be more careful what you write, lest you be considered a Troll. The only nonsense here is your carelessness in writing and therefore wasting everyone's time. Perhaps an apology is in order? Five days of course is a completely different proposition. Pick up the 49 baht Truemove H SIM at the airport(it will have 90 MB of data for you to get started), get them to add 100 baht of credit at the nearest Family Mart or 7/11 and then tap in the code for 2 GB of data(over seven days) for 52.43 baht *900*1954# and then the Dial key. So total cost; 49 baht + 53 baht = 102 baht. If you want to save further, you can get them to add 50 baht of Truemove H credit at the convenience store and then another twelve baht at the orange machine outside the convenience shop. That way you top up just enough for the 53 baht data package. Pick up the 49 baht Truemove H SIM at the airport(it will have 90 MB of data for you to get started), get them to add 100 baht of credit at the nearest Family Mart or 7/11 and then tap in the code for 2 GB of data for 52.43 baht *900*1954# and then the Dial key. You sir ,,, are an absolute champion !! They make these new fangled stuffs so complicated just make it complex to rip us off im sure . Yes its 4-5 days not 45 days . Must have been a typo i expect . My sincere apologies for wasting you good folks time . So I have to buy 49 b truemove then pay 100 b at 7/11 for credit then I can buy 53 baht for 2 GB . Is that not 200 baht ...not that Im bothered about 50 b . 49 baht + 100 baht of credit is 149 baht. From whence did you glean 200 baht? I think Truemove H credit is sold at 50 baht and 90 baht cards in convenience shops. So perhaps a 49 baht SIM and 90 baht worth of credit. As you can see, you can get 5 GB over 5 days for 75 baht worth of credit. Don Muang have wifi, hotspots for the phone providers AND aot complimentary free internet for an hour. If you walk out of the airport, head to the right on the ground floor. Walk to the exit to the Vibavadi road, just around the corner there is a Family Mart. Cross the highway and railroad on the pedestrian bridge, you will see a 7eleven. Walk down the road, and very near there you will have hostels, not sure which one you need to go (i assume it is near the airport as you said grab bike) but walk is easy and bike (no need for grab, just walk to one of the motobike stands, recognize the orange jacket.) to the nearest hostels 15-20 bath.